Continuing a Free but AWESOME Christmas Tradition! I was decorating our house for Christmas after Thanksgiving dinner last week, and I saw a stack of Christmas cards in one of the boxes. I have been keeping the ones we received for the last few years, but I couldn’t remember why. Then it struck me while I was looking through them…my mom and I used to make a Christmas tree out of received cards on the blank wall of my family’s house. I always loved making that card tree because it wasn’t just about decorating. We also read through past cards. As a kid, I laughed at the funny ones and liked to pick out the ones that were the most colorful. I started sorting through the stack of cards I had saved, and then (of course), I started opening them up and reading the little messages. I still laughed at the jokes like I did 20 years ago, but that wasn’t what had me swallowing a lump in my throat. Some of the cards were from friends and coworkers we no longer know. A few were from family we don’t keep up with. And a few of the cards were from my husband’s maternal grandparents…that’s the grandma that passed away a few years ago. Seeing her writing made me tear up and smile at the same time. I decided my card tree this year would be about colors and memories. Now it is my favorite decoration (and I have quite a few inside, lol). I make a list of family friends to send out cards to for the holidays. I like to send personalized Christmas cards as I find them more special than regular store-bought cards. Every year I decorate since it isn’t my hubby’s cup of tea. Since I refuse to climb actual ladders, this means that the inside of our house screams “Christmas!! !” and our home’s exterior is very subdued…like a wreath, some little holiday garden decorations, and I’ve just added a few window posters of Santa with a bag of toys and a Reindeer. I haven’t tackled actual exteriror lights yet even though we have 2 strings on the little tree inside AND a fiber optic tree, lol. We purposefully have a small, fake, hand-me-down Christmas tree. I’ll put a picture below. It’s like 5 1/2 feet tall and is missing one of it’s legs (so I prop it up on that side with a stack of post-it notes instead), but I love it. It was from my parents and was the last tree I remember decorating with them regularly. There was a tree before it that actually had color-coded branches, but this one replaced it when it finally gave up, hahaha. My mom gave it to me when they upgraded to a larger, more modern one that is absolutely gorgeous and Mr. BFS and I got our first apartment. I don’t know if she knows how attached I was to it…one of the best gifts ever. Hubby’s aunt and uncle gave us a fabulous replacement a few years ago when they upgraded, but with their permission, I sold it instead since I really wanted to keep this one. I put a Santa’s hat on top of our tree instead of a star. It started in our first apartment in 2005 when we were broke, didn’t have a star, but did have a Santa’s hat in one of the hand-me-down boxes. We liked it so much, it stuck. We put up a nativity scene every year, even when we had no room and had to put it on the floor, because hubby’s uncle made it. Gordon poured the casts and painted each piece so long ago that even he had forgotten (we reintroduced him to it this year, lol). For the last couple of years, Mr. BFS has cooked a complete Christmas dinner for our closest friends. It’s a blast. I’m now included in a tradition with a couple of our friends. Isabelle and Ivy have been friends since elementary school. Last year, one of my gifts was an ornament from Isabelle and the explanation that they had been exchanging ornaments as side gift forever. Now I was one of them. 🙂 Just having solid friends chokes me up, so this was a huge deal to me. It took me a while to pick out their ornaments this year but I have them already, lol. We have spent the final weekend of the last 8 years at a 3-4 day boardgaming mini-conference called Lonestar. It’s just a fun time and we have been going since it started. Here are my two favorite trees ever. The fiber optic one on the left is just cool. The tree on the right is the one that I am never, ever giving up. What traditions do you enjoy the most? Any cheap ones that make you really happy? 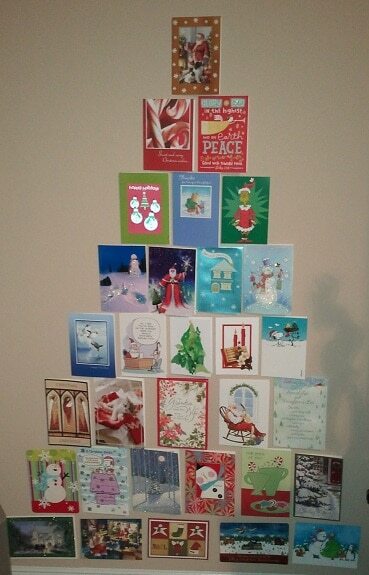 We do Christmas cards on the wall, but usually just use the current year’s batch. And we also buy 1 ornament per person each year that usually relates to something going on with that person that year. A trip or a hobby, etc. We want the tree to be a timeline of our lives in a sense. My family and I have a tradition of purchasing ONE new ornament each year for our tree that somehow represents that year. For example, one year we had several very large snowstorms leading up to Christmas, so we bought an abominable snowman ornament. By doing this our tree is completely decorated with meaningful ornaments and we have a great time as a family putting up the tree and remembering the memory that goes along with each ornament! We.don’t have a ton of traditions yet but the tree always goes up on Black Friday now if we are in town. We don’t get Christmas cards but we don’t send any either. One of our two trees just went up and my wife threw a Santa hat on top of it and loved it, so I had to laugh when I saw that on yours. Like Travis we also buy an ornament each year to symbolize the year somehow-this year will be one for the baby. I love trees that are eclectic, they’re interesting and tell a story! My husband and I have yet to really get started on our own Christmas traditions (we’re not particularly festive people) but my favourite part of the holiday season is all the cooking and baking it encourages me to do. An excuse for one of my favourite hobbies? Yes please! We all know its Christmas in our house as soon as my wife turns every radio station / Pandora to Christmas music. All free! Growing up we had Christmas traditions, but being without kids and family living far away, most of those have gone by the way-side. We do typically put up a tree, but won’t this year as we have a kitten that is a little crazy active yet and I can see him attacking the tree and breaking a lot of irreplaceable ornaments. I’m not festive. At all. I don’t decorate for any holiday. My mom got really offended last year when we finally got a house and I told her we still weren’t decorating(not even a tree! *gasp*). So I told her we were going to get some pinatas instead of stockings and partake in whacking the crap out of a pinata with our lack of christmas spirit. That didn’t really make it at all any better even when I told her I was following our Mexican roots 😉 Last year’s pinatas were a pikachu and a hula girl. Hopefully we can find pinatas just as awesome this year as last year’s! THIS has become our christmas tradition, even if it’s not the same as what I grew up with. Each year every member of the family (4 of us)selects an orament that represents a special place or event that occurred that year. Hard to find any room for the ‘traditional’ ornaments after 28 years of marriage! I am looking forward to making some traditions of my own with my new/growing family. Both my wife and my family have many traditions we have come to love but really are looking forward to making some of our own. Thanks for sharing some of yours! Enjoy the holidays. @Money Beagle, great minds think alike! @Catherine, story trees, love it! @My Money Design, we have our radio station set to Christmas music now too! @Leslie, I would want pictures of that kitten attacking the tree, but I understand your hesitation. @Madison, hahaha! I don’t know why anybody would really care about anybody else’s traditions, lol. I like the pinatas idea! I love the Santa Hat topper and the Christmas card tree. We have lots of decorations collected over the years, and I love when you can take out an ornament and remember where it came from. LOVE this — mostly love how choked up you got! I like the idea of exchanging ornaments, too!